“I’m surprised I’m not in agony,” Lynn remarked the next morning as we walked to the dining hut for breakfast. “I know,” I replied, “I thought I’d be … be… aggghhh!” I screamed as a hot burning pain pierced my right thigh and I turned to run back to our hut. “Whatever is the matter?” Lynn called after me. “Ants! Ants in my pants!” I had left my suitcase on the floor, and fire ants must have crawled in during the night. I tore of my pants, hopping up and down on one leg then the other. Turns out it was only one ant, but a very big one. Everything here was supersized. I shook my pants out the window to send it flying back to where it belonged. The burning lasted a few more minutes as I hobbled to the dining hall. “It was an ant in my pant, to be technically accurate,” I reported to Lynn. Today was beach day. That’s why people come to Tayrona—for the beaches. The jungle itself was rather dry and dusty. The trees, which from what I observed were mainly coconuts and mangoes, were spaced widely. It wasn’t lush and thick like jungles in Guatemala, Costa Rica, or Belize. Maybe it was the time of year. Maybe it lushes out during the rainy season. As soon as we approached the dining hut, our waitress from the night before escorted us to a table. “Seems like we’re destined to always order off the menu,” Lynn said. “That’s fine with me,” Lynn replied. We’d been given the bill for our free meal the night before, just for our records. They had given us two entrees each, then main courses, dessert, a bottle of wine, two bottles of sparkling water, and coffee. It had amounted to about $40 per person including tip, the most expensive meal we would have in Colombia. A 30-something couple sat at a picnic bench outside the dining hut with their three young daughters. They were all eating granola bars. We had seen them emerging from a tent on our way in. “Are they doing this for themselves or for the children?” Lynn wondered. “More like serious, I’d say,” Lynn said. We made our way in the general direction someone had pointed when we asked about beaches. Soon we arrived at a stream, over which someone had thrown some wobbly tree branches. I would have crossed that thing in five seconds had I been on my own. It was the kind of stream I’ve crossed a hundred times in Minnesota. “I am not doing this. I will not!” stated the London girl who had never been on a bicycle, didn’t know how to swim, and had just experienced her first (and last) horseback ride. Other hikers passed us, looked at Lynn curiously, and crossed the stream with no drama. “But you’ll get wet!” Lynn protested. “We’re going to a beach. It’s no deeper than my ankles.” I hoped there weren’t any schistosomiasis larvae in the water. “You’re a good friend,” Lynn said as we walked together over the raging river (not). 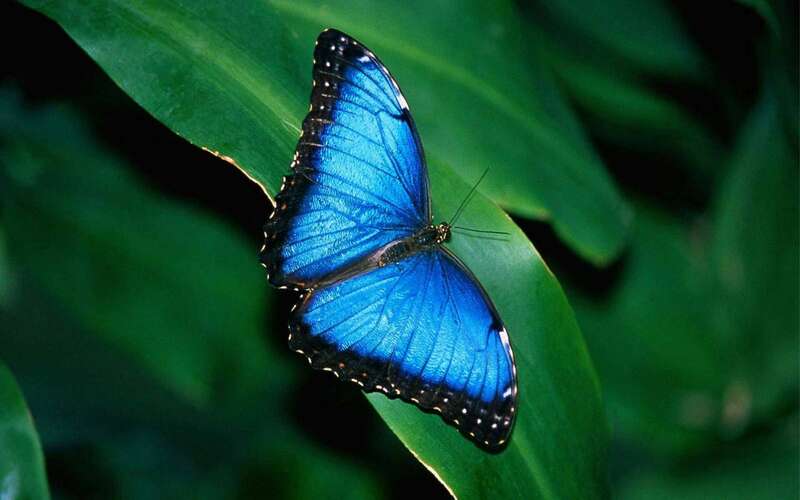 And there, on the other side, was a giant blue butterfly (not my photo, below). “This makes it all worth it,” Lynn murmured as we watched it flutter. This entry was posted in Adventure, Budget travel, class divide, Culture shock, Travel and tagged Colombia, Tayrona National Park on May 10, 2018 by Breaking Free.